I was standing in line at Starbucks when I first learned about Invisible Children shutting down operations in the United States. I did not believe it. I honestly thought it was trolls spreading a rumor. As soon as I got to my office, I started searching for other sources to confirm what I had read. It was true. Growing up, I was never the person to participate in a march or protest. Not that I did not want to, I just didn't have any motivation or inspiration. I did not identify with a cause and I was an entirely different person. In high school, I volunteered a little in Key Club and also served as a House Page in Washington, D.C. But it wasn't until my junior and senior years of high school where I first started to really get involved with my community. After starting an organization that raised money and awareness for pediatric and young adult cancer research, I started to travel on the Vans Warped Tour. That is where I learned about Invisible Children. I traveled on the Vans Warped Tour in 2007, 2008, 2010, and 2011 representing 11:11 A.M. and the Dear Jack Foundation. During this time I worked alongside Invisible Children (and many other great non-profits) roadies and staff, bringing awareness about our causes to young people and inspiring them to get involved. In 2007, I learned who these Invisible Children really were. A war criminal named Joseph Kony (leader of the Lords Resistance Army or LRA) kidnapped children, destroyed villages, and murdered thousands. Sadly, that's not even all of it. The children he kidnapped were then enslaved and turned into child soldiers. Why wasn't this at the top of the list of problems for the United States to address? I heard about Darfur, Somalia, and Rwanda but I never heard the names LRA or Joseph Kony in the news, ever. In 2008 and 2011, the organization I was representing, shared a tour bus with Invisible Children, a band (The Color Fred), and To Write Love On Her Arms (another great organization). That's when I made friends with some of the greatest people in my life that became more like family to me. After the tour, I made sure to keep in touch with everyone because this was a cause I strongly believed in and wanted to donate any free time I had to helping. I knew I couldn't be on the front lines in Uganda, but maybe I could help from where I was. I did just that. Having some experience on Capitol Hill and volunteering in my congressman's office, I spoke to Invisible Children's staff in San Diego and offered my advice on the best way to engage Members of Congress. This resulted in two friends and myself hand-delivering a letter to every Member of Congress, inviting them to the Rescue, which was a series of events taking place all across the United States and the world. The Rescue is the one event that really stood out because we marched from the White House to the Capitol. Thousands and thousands of individuals walked down the National Mall and raised awareness to the fact that these children are being forced into slavery and needed to be rescued. This would be the first time I ever took part in a march or protest. At the same time, a group of us were in charge of photographing and documenting the day. At the event, we heard from congressional leaders that spoke of what was being done legislatively and what we, as activists, had to continue to do to get the attention of our government leaders. At night, we wrote to our Members of Congress, urging them to recognize the atrocities that were occurring by the hands Joseph Kony. We did this all night. It would also be the first time I slept a whole night outside in front of the Capitol. 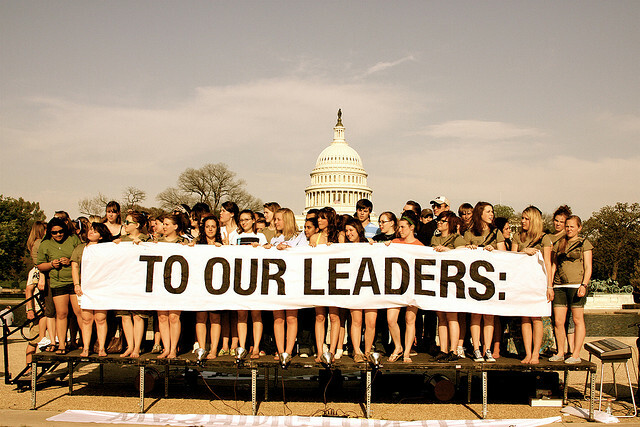 Not long after "the Rescue", Invisible Children held Lobby Days where thousands of individuals descended upon Washington, D.C. to lobby their Members of Congress. Everyone was split into groups and met with staff or the Representative. The main purpose was to ask them to sign onto the LRA Disarmament and Northern Uganda Recovery Act. Essentially, the bill would provide funds and 100 American military advisers to help find Kony and bring him to justice. In 2010, President Obama signed the bill and every six months, it receives re-authorization. What came next for the organization, no one could have predicted. KONY 2012's viral video swept the world and its creators by surprise. Everyone was talking about it. Celebrities, White House staff, lawmakers, musicians, Oprah, everyone mentioned it. It reached millions of views in just a few days. With the success of the KONY 2012 video, Invisible Children had an event in Washington, D.C. to bring experts and world leaders together to discuss what it would take to bring Joseph Kony to justice. I attended this conference and volunteered my photography services. We marched from the convention center to the White House and finally the National Mall. Along the way, people would ask what was going on and it was great to speak to people about the cause. Most people had no idea that the LRA existed yet alone the crimes they were committing. 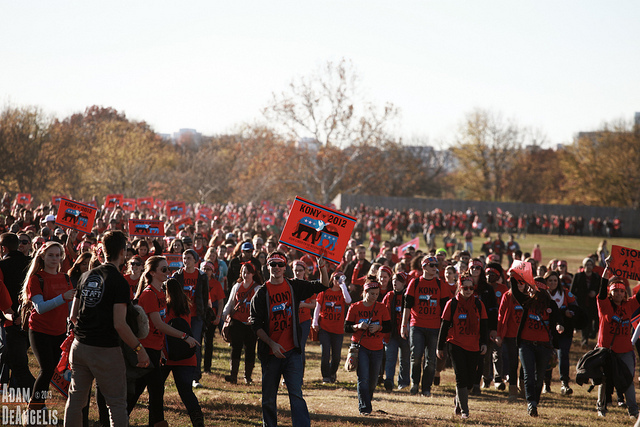 What I felt was important about this event was the attendance of thousands of people who had one message for our government leaders: Joseph Kony must be brought to justice. I could go on and on about the many Invisible Children events that I attended or volunteered at because it is a cause that has been a part of some of the important years of my life. I consider my years at college a very important time where I discovered what I wanted to do for the rest of my life -- help others. I've shared these stories because Invisible Children has changed my life. It got me involved. It made me realize what I was meant to do, be an advocate or a voice for the voiceless. Whether it's for cancer research, senior citizens, suicide prevention, or child soldiers in Africa, Invisible Children gave me the motivation and inspiration to get involved with my community and donate time to helping those in need. At the time, Invisible Children events were the only times I had ever marched in the streets and demanded justice. As time has gone on, I've advocated for the Congressional Page Program, seniors' issues, and young adult cancer research. Furthermore, Invisible Children has inspired me to work in the non-profit sector as a career. I can honestly say, I don't believe I would have gone down this path if it weren't for Invisible Children, the events I attended, and the volunteer work I did. I urge everyone, especially young people, to find a cause they believe in or volunteer in your community. It truly does make a difference, not just in the lives of those you are helping but also for yourself. You might discover something you may have never known about yourself. I certainly did. So, I end with this, thank you to Invisible Children, especially Alex, Andrew, Kenny, Anna, Jason, Bobby, Laren, Aaron, Abby, Ivory and everyone else I met along the way. If it weren't for you, I wouldn't be the person I am today, an activist.